Free Shipping Included! Canvas Prints Wall Art Coconut Palm Tree on Sea Beach Sunshine Summer Season Framed Ready to Hang - 5 Panels Contemporary Painting Teal Canvas Art on Canvas for Home and Office Decoration by yearainn at Tecac. Hurry! Limited time offer. Offer valid only while supplies last. 5 Piece Large Canvas Painting Sea Wave Palm Tree on Beach Summer Season Ocean Art Canvas Prints Wall Art Framed Ready to Hang for Home Decoration. 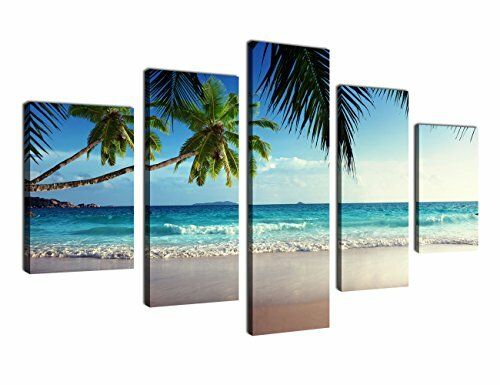 5 Piece Large Canvas Painting Sea Wave Palm Tree on Beach Summer Season Ocean Art Canvas Prints Wall Art Framed Ready to Hang for Home Decoration. HD giclee printing on premium canvas. Environmentally friendly, waterproof, UV-resistant, color fading-resistant more than 50 years indoor. Fast shipping and risk fred. 30 days 100% refund guarantee without any reason of receipt of shipment. Perfect home decoration idea for living room, bedroom, bathroom, office and any other space. ize: 12x16in 2P + 12x24in 2P + 12x32in 1P (30x40cm 2P + 30x60cm 2P + 30x80cm 1P), total 5 panels. Sea Charm - Forest Stream Print on Canvas - Gallery Wrapped Canvas - Modern Home Office Decoration Rainforest Wall Art - Landscape Giclee Art Ready to Hang - 24"x40"